Not to be confused with Yucca. 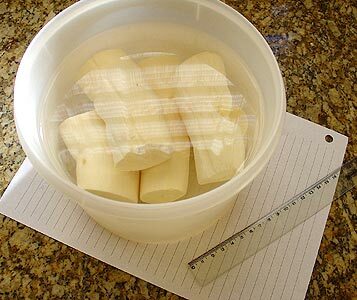 Manioc (or Cassava, or Yuca, especially in Latin America) is a shrub. It belongs to the Spurge family of plants and it grows in tropical climates. It is cultivated for its edible root. The manioc must be cooked properly to detoxify it before it is eaten and can be used in dumplings, soups, stews and gravies. The cassava root is long and tapered, with a firm, homogeneous flesh encased in a detachable rind, about 1 mm thick, rough and brown on the outside. Commercial cultivars can be 5 to 10 cm (2.0 to 3.9 in) in diameter at the top, and around 15 to 30 cm (5.9 to 11.8 in) long. A woody vascular bundle runs along the root's axis. The flesh can be chalk-white or yellowish. Cassava roots are very rich in starch and contain small amounts of calcium (16 mg/100g), phosphorus (27 mg/100g), and vitamin C (20.6 mg/100g). However, they are poor in protein and other nutrients. In contrast, cassava leaves are a good source of protein (rich in lysine), but deficient in the amino acid methionine and possibly tryptophan. Wild populations of M. esculenta subspecies flabellifolia, shown to be the progenitor of domesticated cassava, are centered in west-central Brazil, where it was likely first domesticated no more than 10,000 years BP. Forms of the modern domesticated species can also be found growing in the wild in the south of Brazil. By 4,600 BC, manioc (cassava) pollen appears in the Gulf of Mexico lowlands, at the San Andrés archaeological site. The oldest direct evidence of cassava cultivation comes from a 1,400-year-old Maya site, Joya de Cerén, in El Salvador. With its high food potential, it had become a staple food of the native populations of northern South America, southern Mesoamerica, and the Caribbean by the time of European contact in 1492. Cassava was a staple food of pre-Columbian peoples in the Americas and is often portrayed in indigenous art. The Moche people often depicted yuca in their ceramics. 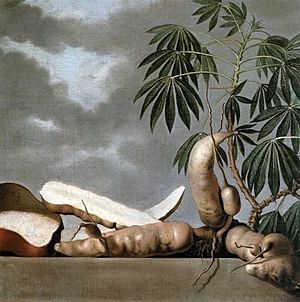 Spaniards in their early occupation of Caribbean islands did not want to eat cassava or maize, which they considered insubstantial, dangerous, and not nutritious. They much preferred foods from Spain, specifically wheat bread, olive oil, red wine, and meat, and considered maize and cassava damaging to Europeans. For these Christians in the New World, cassava was not suitable for communion since it could not undergo transubstantiation and become the body of Christ. "Wheat flour was the symbol of Christianity itself" and colonial-era catechisms stated explicitly that only wheat flour could be used. The cultivation and consumption of cassava was nonetheless continued in both Portuguese and Spanish America. Mass production of cassava bread became the first Cuban industry established by the Spanish, Ships departing to Europe from Cuban ports such as Havana, Santiago, Bayamo, and Baracoa carried goods to Spain, but sailors needed to be provisioned for the voyage. The Spanish also needed to replenish their boats with dried meat, water, fruit, and large amounts of cassava bread. Sailors complained that it caused them digestive problems. Tropical Cuban weather was not suitable for wheat planting and cassava would not go stale as quickly as regular bread. Cassava was introduced to Africa by Portuguese traders from Brazil in the 16th century. Around the same period, it was also introduced to Asia through Columbian Exchange by Portuguese and Spanish traders, planted in their colonies in Goa, Malacca, Eastern Indonesia, Timor and the Philippines. Maize and cassava are now important staple foods, replacing native African crops. Cassava has also become an important staple in Asia, extensively cultivated in Indonesia, Thailand and Vietnam. Cassava is sometimes described as the "bread of the tropics" but should not be confused with the tropical and equatorial bread tree (Encephalartos), the breadfruit (Artocarpus altilis) or the African breadfruit (Treculia africana). In 2016, global production of cassava root was 277 million tonnes, with Nigeria as the world's largest producer having 21% of the world total (table). Other major growers were Thailand, Brazil, and Indonesia. Cassava is one of the most drought-tolerant crops, can be successfully grown on marginal soils, and gives reasonable yields where many other crops do not grow well. Cassava is well adapted within latitudes 30° north and south of the equator, at elevations between sea level and 2,000 m (6,600 ft) above sea level, in equatorial temperatures, with rainfalls from 50 mm (2.0 in) to 5 m (16 ft) annually, and to poor soils with a pH ranging from acidic to alkaline. These conditions are common in certain parts of Africa and South America. Cassava is a highly-productive crop when considering food calories produced per unit land area, per unit of time. 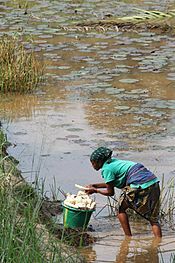 Significantly higher than other staple crops, cassava can produce food calories at rates exceeding 250 kcal/hectare/day, as compared with 176 for rice, 110 for wheat and 200 for maize (corn). Cassava, yams (Dioscorea spp. ), and sweet potatoes (Ipomoea batatas) are important sources of food in the tropics. The cassava plant gives the third-highest yield of carbohydrates per cultivated area among crop plants, after sugarcane and sugar beets. Cassava plays a particularly important role in agriculture in developing countries, especially in sub-Saharan Africa, because it does well on poor soils and with low rainfall, and because it is a perennial that can be harvested as required. Its wide harvesting window allows it to act as a famine reserve and is invaluable in managing labor schedules. It offers flexibility to resource-poor farmers because it serves as either a subsistence or a cash crop. Worldwide, 800 million people depend on cassava as their primary food staple. No continent depends as much on root and tuber crops in feeding its population as does Africa. In the humid and sub-humid areas of tropical Africa, it is either a primary staple food or a secondary costaple. In Ghana, for example, cassava and yams occupy an important position in the agricultural economy and contribute about 46 percent of the agricultural gross domestic product. Cassava accounts for a daily caloric intake of 30 percent in Ghana and is grown by nearly every farming family. The importance of cassava to many Africans is epitomised in the Ewe (a language spoken in Ghana, Togo and Benin) name for the plant, agbeli, meaning "there is life". In Tamil Nadu, India, there are many cassava processing factories alongside National Highway 68 between Thalaivasal and Attur. Cassava is widely cultivated and eaten as a staple food in Andhra Pradesh and in Kerala. In Assam it is an important source of carbohydrates especially for natives of hilly areas. In the subtropical region of southern China, cassava is the fifth-largest crop in term of production, after rice, sweet potato, sugar cane, and maize. China is also the largest export market for cassava produced in Vietnam and Thailand. Over 60 percent of cassava production in China is concentrated in a single province, Guangxi, averaging over seven million tonnes annually. Alcoholic beverages made from cassava include cauim and tiquira (Brazil), kasiri (Guyana, Suriname), impala (Mozambique), masato (Peruvian Amazonia chicha), parakari or kari (Guyana), nihamanchi (South America) also known as nijimanche (Ecuador and Peru), ö döi (chicha de yuca, Ngäbe-Bugle, Panama), sakurá (Brazil, Suriname), tarul ko jaarh (Darjeeling, Sikkim, India). Cassava-based dishes are widely consumed wherever the plant is cultivated; some have regional, national, or ethnic importance. Cassava must be cooked properly to detoxify it before it is eaten. Cassava can be cooked in many ways. The root of the sweet variety has a delicate flavor and can replace potatoes. 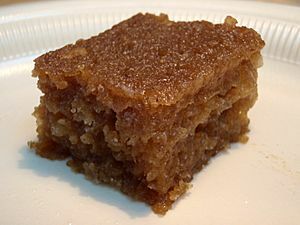 It is used in cholent in some households. It can be made into a flour that is used in breads, cakes and cookies. In Brazil, detoxified manioc is ground and cooked to a dry, often hard or crunchy meal known as farofa used as a condiment, toasted in butter, or eaten alone as a side dish. Raw cassava is 60% water, 38% carbohydrates, 1% protein, and has negligible fat (table). In a 100 gram amount, raw cassava provides 160 calories and contains 25% of the Daily Value (DV) for vitamin C, but otherwise has no micronutrients in significant content (no values above 10% DV; table). Cooked cassava starch has a digestibility of over 75%. Cassava, like other foods, also has antinutritional and toxic factors. 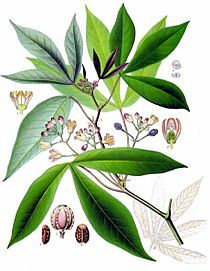 Of particular concern are the cyanogenic glucosides of cassava (linamarin and lotaustralin). On hydrolysis, these release hydrocyanic acid (HCN). The presence of cyanide in cassava is of concern for human and for animal consumption. The concentration of these antinutritional and unsafe glycosides varies considerably between varieties and also with climatic and cultural conditions. Selection of cassava species to be grown, therefore, is quite important. Once harvested, bitter cassava must be treated and prepared properly prior to human or animal consumption, while sweet cassava can be used after simply boiling. A comparative table shows that cassava is a good energy source. In its prepared forms in which its toxic or unpleasant components have been reduced to acceptable levels, it contains an extremely high proportion of starch. Compared to most staples however, cassava accordingly is a poorer dietary source of protein and most other essential nutrients. Though an important staple, its main value is as a component of a balanced diet. Comparisons between the nutrient content of cassava and other major staple foods when raw, as shown in the table, must be interpreted with caution because most staples are not edible in such forms and many are indigestible, even dangerously poisonous or otherwise harmful. For consumption, each must be prepared and cooked as appropriate. Suitably cooked or otherwise prepared, the nutritional and antinutritional contents of each of these staples is widely different from that of raw form and depends on the methods of preparation such as soaking, fermentation, sprouting, boiling, or baking. In many countries, significant research has begun to evaluate the use of cassava as an ethanol biofuel feedstock. Under the Development Plan for Renewable Energy in the Eleventh Five-Year Plan in the People's Republic of China, the target is to increase the production of ethanol fuel from nongrain feedstock to two million tonnes, and that of biodiesel to 200 thousand tonnes by 2010. This is equivalent to the replacement of 10 million tonnes of petroleum. 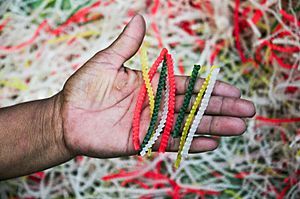 As a result, cassava (tapioca) chips have gradually become a major source of ethanol production. On 22 December 2007, the largest cassava ethanol fuel production facility was completed in Beihai, with annual output of 200 thousand tons, which would need an average of 1.5 million tons of cassava. In November 2008, China-based Hainan Yedao Group reportedly invested US$51.5m (£31.8m) in a new biofuel facility that is expected to produce 33 million US gallons (120,000 m3) a year of bioethanol from cassava plants. 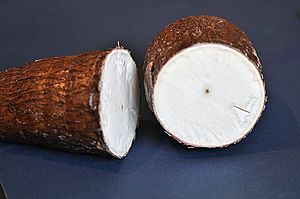 Cassava tubers and hay are used worldwide as animal feed. Cassava hay is harvested at a young growth stage (three to four months) when it reaches about 30 to 45 cm (12 to 18 in) above ground; it is then sun-dried for one to two days until its final dry matter content approaches 85 percent. Cassava hay contains high protein (20–27 percent crude protein) and condensed tannins (1.5–4 percent CP). It is valued as a good roughage source for ruminants such as cattle. Manioc is also used in a number of commercially available laundry products, especially as starch for shirts and other garments. Using manioc starch diluted in water and spraying it over fabrics before ironing helps stiffen collars. Cassava starch processing near Hanoi, Vietnam. Manioc Facts for Kids. Kiddle Encyclopedia.